Ford School faculty spearhead rigorous, game–changing research, and they regularly engage with policymakers and practitioners around substantive policy challenges. This vital work informs their teaching and mentoring, enhancing what they offer to tomorrow's policy leaders. Poverty and economic development. Health and human security. Energy and the environment. Alongside their critical work as teachers and mentors, Ford School faculty members are nationally and internationally recognized experts in these and other vitally important policy areas. Our faculty use cutting–edge social science research methods, including demonstration trials, complex–adaptive systems approaches, mixed–methods studies, elite opinion surveys, and more. Through their research, Ford School faculty have made transformational discoveries—identifying new methods for fostering cooperation in the midst of intractable conflicts, slowing the spread of life-threatening diseases, and designing low–cost methods to reduce poverty in developing nations. At the same time, Ford School faculty members are deeply committed to policy engagement and action. On critically important policy issues, our brilliant researchers are seeking and finding actionable policy solutions, building consensus, and mobilizing action. They've grown the number of low–income students who attend college by working to simplify a complex financial aid form. They've helped communities balance the economic and environmental issues raised by fracking—arming state and local government leaders with trustworthy information on policy options. And they've saved lives by working to regulate the trade of weapons to countries with poor human rights records. 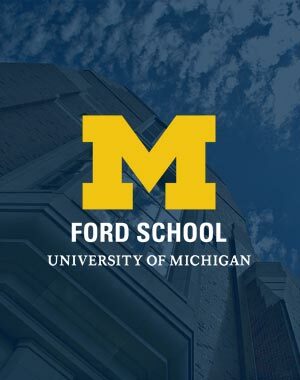 The Ford School is home to or co-sponsor of a number of multi-disciplinary research centers and initiatives that focus on a range of pressing policy concerns, engaged across all levels of governance: local, state, national and international. The Michigan Education Data Center, housed at U-M’s Gerald R. Ford School of Public Policy, will build and act as a clearinghouse for educational records provided to researchers while maintaining the privacy rights of students. U-M has extensive experience in securely hosting both local and national datasets, and the new data center will carry that tradition forward. At U-M, the campus-wide effort will be spearheaded by Turn Up Turnout (TUT), a nonpartisan group Goldenberg founded to promote informed voting on campus. In this Sunday’s New York Times print edition, Susan Dynarski, professor of public policy at the Ford School, disputes the effectiveness of online courses, particularly for less proficient students. In “A job well done: Youth employment program offers mentors, life skills,” the University Record highlights Poverty Solutions’ Summer Youth Employment Program. The pilot program, launched this summer, is pairing more than three-dozen local youth--the majority of them from families with financial need--with faculty and staff across the University of Michigan. The goal: To offer work experience, mentorship, and life skills training. Making the case for paid family leave in the U.S.
Ford School faculty members have conducted research and discovered new findings in energy and environmental policy.